If you know me in person, you will know that I’m a HUGE lush fan. I’ve bought their products for years (since 2010). Any who, I picked up a few pieces from their Valentine’s Day collection and from their normal range. The second shower gel I purchased was Rose Jam (100g for £5.95) – which isn’t part of the Valentine’s Day range, however, I’ve heard really great things about it, so I wanted to give it a go. It smells divine! “Turkish rose absolute and conditioning argan oil dance their dizzyingly floral fragrance over skin, leaving a gentle, lingering perfume behind. As well as being made with sweet vanilla pod infusion, combined with cleansing Sicilian lemon oil and fresh goji berry juice. I love anything and everything that’s rose and vanilla scented so this one is a winner in my eyes! I also picked up Damaged Hot Oil Treatment (£6.95) for hair. I was really intrigued by Lush’s hair range – there’s SO many products I want to try! My hair has been a little damaged from the heat of my hair-dyer, straightener and curling tong, so it needed a bit of TLC. This worked wonders of my hair – it feels so soft, shiny and healthy after using it. And, it was really fun to use – you pour boiling water into a mug and then stir the formula until you get a gloopy (such a weird word) mixture, you then apply that to dry hair and leave it in for twenty minutes before rinsing out. Then I picked up the Aubergine emoji bath bomb (limited edition), which is priced at £3.95. This was really pretty to watch dissolve it the bath, almost therapeutic seeing all the colours come alive! It also had glitter in the formula which glistened on my skin when I came out of the bath. Lastly I picked up a BB Seaweed Fresh face mask (priced at £8.50) as I had 5 pots to return which meant I got a free face mask (winner winner, chicken dinner *does a little dance*)! I forgot to include the mask in the photo’s but I thought I would talk about it anyway! It’s so lovely to use and I feel great putting natural ingredients on my skin! Have you tried this year’s Valentine’s Day range? Or do you have any recommendations of Lush products? I’d love to know, leave me a comment below! You may also be interested in Lush Shower Bombs: Sleepy and Not Sleepy Review, Lush Don’t Look At Me Face Mask Review, Lush Mask of Magnaminty Review, My All Time Favourite Lush Staples and Brand Spanking NEW Lush Jelly Face Masks! Yay or Nay? Let’s get social. Follow me on Instagram or Twitter. I’m also on Bloglovin, Pinterest and Youtube. I’ll be interested to try out the hot oil treatment! Thanks for commenting! It’s really lovely – a little messy though! You definitely should – they have so many amazing products! I used to be addicted to Lush products but I haven’t used any in such a long time. It would be interesting to give some of them a go again..
Me too – it’s been months since I shopped at Lush, however I’d forgotten how many wonderful products they sell. It has gone up in price though which is a shame! I love the American Cream scent – I’ve already picked ups 500ml bottle but I might have to get another one just incase! I also adore the love boat, it smells like love heart sweets. It’s gorgeous isn’t it! Good idea stocking up as I think it’s limited edition! Ooo I didn’t see the love boat in my local Lush store – tempted to pick one up next time I’m in Lush. It can be quite overpowering I agree! 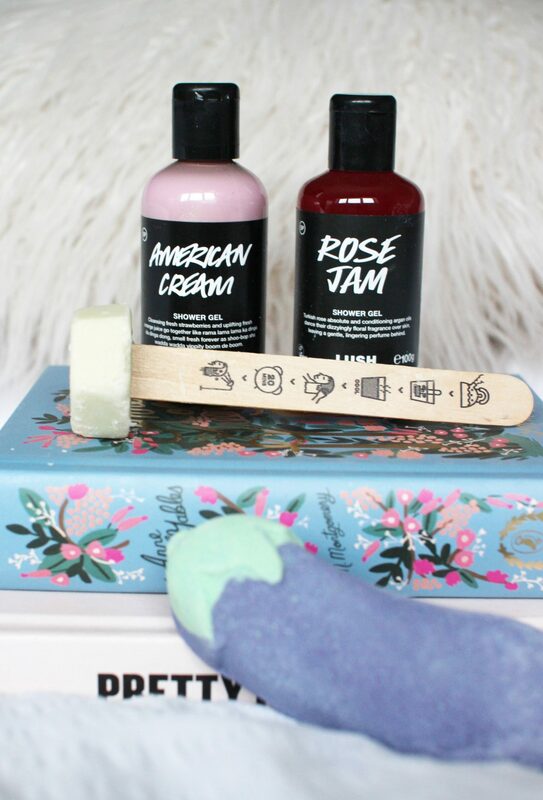 The rose jam shower gel is amazing – highly recommend! Thanks Hannah :). It’s gorgeous isn’t it?! I love American Cream too – smells amazing! I love the american cream showergel too. It smells so amazing and it leaves my skin feeling gorgeous as well. I’m really curious about Rose Jam too, it sounds like it’d be right up my alley. It’s gorgeous isn’t it?! I prefer Rose Jam out of the two – deffo worth trying! I really want to try some of their body sprays! Maybe next time I pop in Lush, I’ll treat myself to one. Me too – they take so much care into making the product and the way they advertise each individual product too. 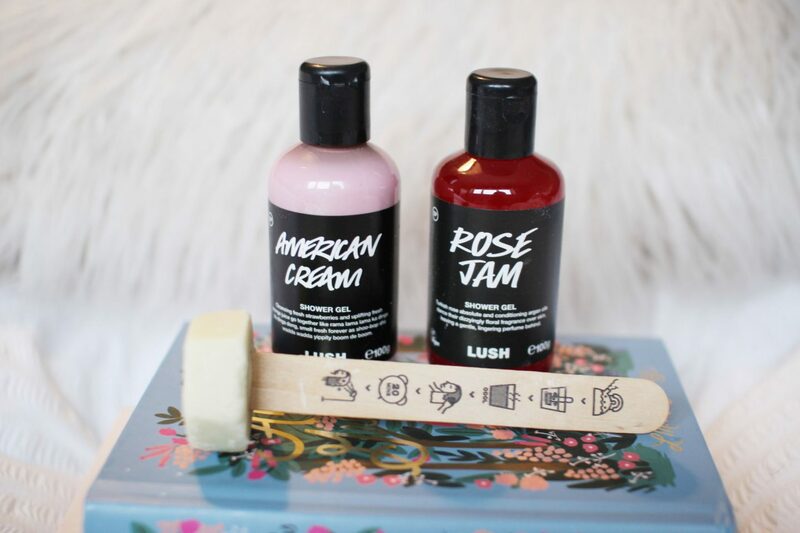 Rose Jam is my absolute favourite Lush scent!